Intra-abdominal pressure: The IAP is the steady-state pressure concealed within the abdominal cavity. The reference standard for intermittent IAP measurements is via the bladder, it should be expressed in mmHg and measured at end-expiration in the supine position after ensuring that abdominal muscle contractions are absent and with the transducer zeroed at the level where the midaxillary line crosses the iliac crest. Baseline IAP: also called resting, starting, static or opening IAP during laparoscopy is the IAP obtained at normal resting conditions. Normal IAP is approximately 5–7 mmHg in healthy individuals, and around 10 mmHg in critically ill adults. Intra-abdominal hypertension: IAH is defined by a sustained or repeated pathological elevation in IAP ≥ 12 mmHg. IAH is graded as follows: Grade I, IAP 12–15 mmHg; Grade II, IAP 16–20 mmHg; Grade III, IAP 21–25 mmHg and Grade IV, IAP > 25 mmHg. Abdominal compartment syndrome: ACS is defined as a sustained IAP > 20 mmHg (with or without an APP < 60 mmHg) that is associated with new organ dysfunction/failure. In contrast to IAH, ACS is an all-or-nothing phenomenon. Delta IAP: ΔIAP is calculated as the difference between the endinspiratory (IAPei) and the endexpiratory IAP (IAPee) value. The higher the ΔIAP, the lower the Cab. ΔIAP = IAPei – IAPee. Abdominal pressure variation: APV is calculated as the difference between the IAPei and the IAPee value or thus ΔIAP divided by the mean IAP (MIAP) and expressed as a percentage. The higher the APV, the lower the Cab. Baseline IAV: also called resting, starting or static IAV which is the IAV at baseline conditions without additional pathologic volume increase or Cab decrease, with corresponding baseline IAP. The baseline IAV in healthy individuals is found to be around 13 litres. Abdominal distention: is defined as a sagittal abdominal diameter (approximately at the level of the umbilicus) higher than the virtual line between xiphoid and symphysis pubis. Abdominal workspace: this is the additional IAV that can be added upon the baseline IAV when IAP is limited to a certain pressure (e.g. 14 mmHg during laparoscopic surgery). The normal workspace during laparoscopy ranges between 3 and 6 litres. Maximal stretched volume: the maximal volume is calculated as the baseline IAV + the maximal workspace resulting in maximal stretch of the abdominal cavity (from ellipse to sphere on transverse plane). The maximal stretched volume depends on baseline IAP and Cab. 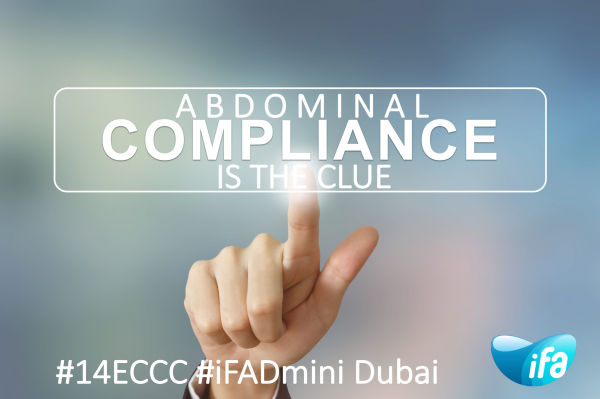 Abdominal compliance: abdominal compliance (Cab) is defined as a measure of the ease of abdominal expansion, which is determined by the elasticity of the abdominal wall and diaphragm. An increased compliance indicates a loss of elastic recoil of the abdominal wall. A decreased compliance means that the same change in IAV will result in a greater change in IAP. It should be expressed as the change in intra-abdominal volume (IAV) per change in IAP (ml/mmHg). Normal Cab is around 250 to 450 mL/mmHg. Abdominal PV relationship: Importantly, Cab is measured differently than IAP, it is only a part of the total abdominal pressure-volume (PV) relationship. The relation between IAV and IAP is curvilinear with an initial linear part followed by an exponential increase once a critical volume is reached (Figure). Malbrain MLNG, Van deVijver K, Verstraeten AS, Van Regenmortel N, De laet I, Schoonheydt K, Dits H: The Respiratory Abdominal Variation Test (RAVT): A Noninvasive Way To Estimate Abdominal Wall Compliance (cab) At The Bedside. Am Surg 2011, 77(Supplem 1):S98. Malbrain ML, Peeters Y, Wise R: The neglected role of abdominal compliance in organ-organ interactions. Critical care (London, England) 2016, 20:67. Malbrain MLNG, De laet I, De Waele J, Sugrue M, Schachtrupp A, Duchesne J, Van Ramshorst G, De Keulenaer B, Kirkpatrick AW, Ahmadi Noorbakhsh S et al: The role of abdominal compliance, the neglected parameter in critically ill patients - a consensus review of 16. Part 2: Measurement techniques and management recommendations. Anaesthesiol Intensive Ther 2014, 46(5):406-432. Malbrain MLNG, Roberts DJ, De laet I, De Waele J, Sugrue M, Schachtrupp A, Duchesne J, Van Ramshorst G, De Keulenaer B, Kirkpatrick AW et al: The role of abdominal compliance, the neglected parameter in critically ill patients - a consensus review of 16. Part 1: Definitions and pathophysiology. Anaesthesiol Intensive Ther 2014, 46(5):392-405. Blaser AR, Bjorck M, De Keulenaer B, Regli A: Abdominal compliance: A bench-to-bedside review. The journal of trauma and acute care surgery 2015, 78(5):1044-1053. Kirkpatrick AW, Roberts DJ, De Waele J, Jaeschke R, Malbrain ML, De Keulenaer B, Duchesne J, Bjorck M, Leppaniemi A, Ejike JC et al: Intra-abdominal hypertension and the abdominal compartment syndrome: updated consensus definitions and clinical practice guidelines from the World Society of the Abdominal Compartment Syndrome. Intensive care medicine 2013, 39(7):1190-1206. Malbrain MLNG, Roberts DJ, Sugrue M, De Keulenaer BL, Ivatury R, Pelosi P, Verbrugge F, Wise R, Maes H, Mullens W: The Polycompartment Syndrome: A Concise State-of-the-Art Review. Anaesthesiol Intensive Ther 2014, 46(5):433-450.